Rhinoplasty Beverly Hills patients know a thing or two about their facial harmony and the appearance of a well-balanced nose. Unfortunately, they were born with unattractive dorsal humps, turned up nasal tips or suffered from a nasal injury that left them with no other choice but to undergo facial plastic surgery. However, there are many patients who are not ready to receive invasive nose surgery and desire simple, subtle changes of the nose to achieve an enhanced look. With the latest advancements in plastic surgery, we now have the ability to help you regain confidence in your self-image with non-surgical rhinoplasty. What was once known as a reconstructive procedure to undo damages of the face due to injury or birth defects, has now become streamlined as a huge achievement in the plastic surgery field. According to statistics from the American Society of Plastic Surgeons, the largest plastic surgery specialty organization in the world, over 220,000 nose reshaping procedures were performed in 2013, making it the second most popular cosmetic procedure in the United States. As it turns out, a great majority of these patients underwent the likes of non-surgical reconstruction. Allow us to inform you about the non-surgical rhinoplasty technique. It is no surprise that the majority of nose surgery patients do not wish to experience pain or discomfort, which is why patients turn to non-surgical rhinoplasty. This nose surgery technique uses subcutaneous injections of soft-tissue dermal fillers and muscle relaxers to make subtle changes of the nasal appearance. Controlled and precise measurements of either product or combination are injected to achieve a more proportional look that is painless. This procedure adheres to multiple aesthetic issues of a patient’s nasal frame, including indentations, humps on the nasal bridge, drooping nasal tips and more. In many cases however, most patients learn that their expectations and major reconstruction can only be achieved with the traditional rhinoplasty procedure. However, patients with small nasal appearance issues, find their results to be significantly improved for facial harmony. There are many solutions that the non-surgical rhinoplasty procedure can achieve for a patient. By injecting dermal fillers, the appearance of bumps on the nose or nasal bridge diminishes and appears straighter. In other patients, the combination of Botox and Restylane can augment the nasal bridge to appear flat and even after injection. The patient featured here had concerns with the crooked look on the frontal view of her nose. 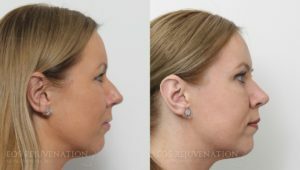 The large hump and droopy nasal tip were the drawbacks she was unhappy with, and she was not ready for invasive surgery. 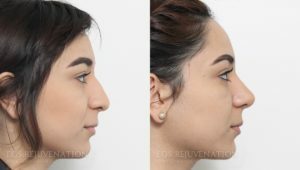 With carefully placed dermal filler injections, her nose is now straight in the frontal view of the nose, and her profile view shows the appearance of a reduced hump and a lifted tip. As mentioned before, the non-surgical rhinoplasty will not repair every problem, but it is a perfect alternative for patients who desire a slight change in their appearance. If you want to learn more about your options for noninvasive nose surgery, then contact our cosmetic surgeon online or reach our office directly at (310) 772-2866 to schedule a consultation.